Where do ticks live and when are they active? How did the tick get on me or onto my pet? Do ticks really cause harm? What should you do with a tick that has been removed? Diverse kinds (species) of ticks can be found across North America, and many more are present on other continents. Fortunately, just a limited array of ticks across the globe attack people and pets; the rest feed upon birds and other animals. Our services here on this website focus mainly on identifying those ticks that are of public health importance. Whereas some of these cause annoyance and direct harm when they blood feed, others transmit infectious agents that can cause disease. We encourage you to submit your ticks for prompt and expert identification rather than pouring over images and descriptions as you try to become an overnight expert. Even if you have a non-fed tick in pristine condition, it can be difficult for the non-expert to match it to the correct image. 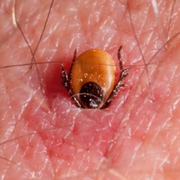 It becomes far more challenging to perform this task once the tick has begun to feed and expand, or if the tick was damaged during removal and handling. An expert can quickly identify the tick even if it is in poor condition. This can be done by examining the tick directly (usually with the help of a microscope), or by viewing good digital images of the specimen. It is in your best interest to promptly find and remove any tick you find on you, your family and your pets. Remove and save the tick, and send it (or upload digital images of it) to IdentifyUS. We will quickly and expertly identify the tick, alert you as to the tick’s stage of development and judge its duration of attachment. All these characteristics are important in assessing the extent of risk posed by the tick. If it is a species of tick that may be of concern, you can also elect to get the tick tested for certain pathogens. Click here to learn more about testing for tick-borne diseases agents.